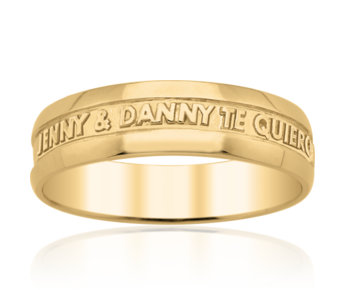 Subtle and simple, customize this 10K or 14K gold Tribute Band for almost any memorable occasion! Available from sizes 9 to 12. Maximum number of characters vary with ring size. Also available in 7 mm width. 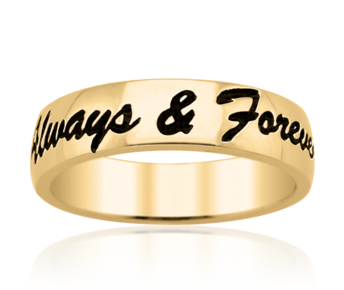 Subtle and simple, customize this 10K or 14K gold Tribute Band for almost any memorable occasion! Available from sizes 4 to 8.75. Maximum number of characters vary with ring size. Also available in 7 mm width. 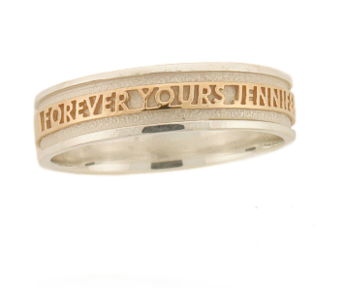 Subtle and simple, customize this 10K or 14K gold Tribute Band for almost any memorable occasion! Available from sizes 9 to 12. Maximum number of characters vary with ring size. Also available in 5 mm width. 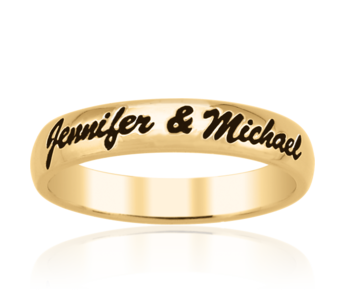 Subtle and simple, customize this 10K or 14K gold Tribute for almost any memorable occasion! Available from sizes 4 to 8.75. 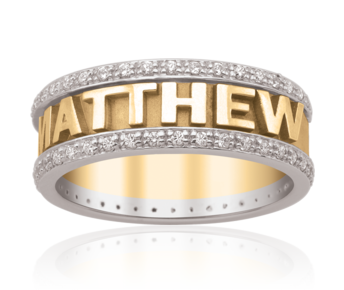 Maximum number of characters vary with ring size. Also available in 5 mm width. Make an expressive and infinate statement with this bold and striking 10K or 14K gold Tribute Band. Available from sizes 9 to 12. Maximum number of characters vary with ring size. Also available in 7 mm width. Make an expressive and infinate statement with this bold and striking 10K or 14K gold Tribute Band. Available from sizes 4 to 8.75. Maximum number of characters vary with ring size. Also available in 7 mm width. Make an expressive and infinate statement with this bold and striking 10K or 14K gold Tribute Band. Available from sizes 9 to 12. Maximum number of characters vary with ring size. Also available in 5 mm width. Make an expressive and infinate statement with this bold and striking 10K or 14K gold Tribute Band. Available from sizes 4 to 8.75. 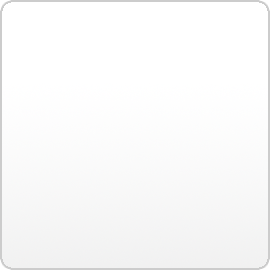 Maximum number of characters vary with ring size. Also available in 5 mm width. For those who like to mix it up alittle! 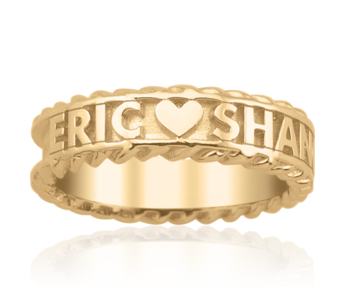 This combined sterling silver and 10kt yellow gold Tribute Band makes the perfect celebration ring. Available from size 9 to 12. Maximum number of characters vary with ring size. Also available in 7 mm width. For those who like to mix it up alittle! This combined sterling silver and 10kt yellow gold Tribute Band makes the perfect celebration ring. Available from size 4 to 8.75. Maximum number of characters vary with ring size. Also available in 7 mm width. For those who like to mix it up alittle! This combined sterling silver and 10kt yellow gold Tribute Band makes the perfect celebration ring. Available from sizes 9 to 12. Maximum number of characters vary with ring size. Also available in 5 mm width. For those who like to mix it up alittle! 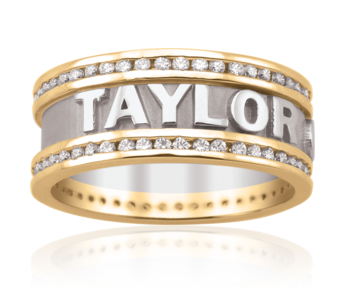 This combined sterling silver and 10kt yellow gold Tribute Band makes the perfect celebration ring. Available from sizes 4 to 8.75. Maximum number of characters vary with ring size. Also available in 5 mm width.